Ian has embraced adventure all his life - from scaling the shed roof at aged 3 to skiing to the South Pole at aged 58. He has also climbed 5 of the "7 Summits" ", cycled 5,000 KMS solo & unsupported across Australia (twice) around the coastline of Iceland and to the Arctic Ocean and run 10 marathons. But the thing about Ian is that he is an ordinary guy, from a rural background in England, who has decided to push himself to achieve extraordinary things at the very edge of his own comfort zone. He is not an explorer, world record holder or super-fit world-class endurance athlete, but is a Chartered Accountant who has led in many ways a regular life. Ian is a natural and authentic speaker who passionately shares the lessons learned from his adventures and business with audiences around the world. As well as corporate keynote events, Ian speaks to students of all ages. Ian is also a philanthropist, who regularly donates funds raised on his expeditions and speaking fees in aid of relief organizations and charitable ventures. Go on, book Ian to inspire, challenge and entertain your management, staff or students! Click HERE to contact Ian! Having Ian Evans come to our school and speak about his adventures was exceptional. His message of perseverance, commitment, and drive to achieve the unimaginable was inspiring for all our students SK to Grade 12. He is a dynamic and engaging speaker in large group settings and he also did small class visits where students could connect with him more personally, ask questions, and learn more about this amazing adventurer. “Ian gave a fantastic inspirational presentation at our annual manager’s meeting. He is easily able to captivate the audience with his incredible life experiences and adventures from around the globe. Ian’s sheer determination is inspirational in itself and our managers were still talking about the presentation days later!" “Ian’s speech was an incredible experience for all of us. It was inspiring, authentic, and motivating. The students were so excited about Ian’s story and message. We would recommend Ian to any school wishing to inspire their students to break out of their comfort zones and truly own who they are as individuals. A wonderful way to start the day!" "Ian is a talented speaker that kept 100 Grade 8's mesmerized! The presentations were perfect for our needs - he took our suggestions to link his experiences to our programming effortlessly. It was inspirational to hear how Ian overcame huge mental, physical and emotional challenges on the South Pole Expedition". "Fantastic inspirational talk to our new year 12 from Polar Explorer Ian Evans. Brilliant! Mental toughness personified". WHEN IT COMES TO FOLLOWING YOUR DREAMS, HOW OLD IS "TOO OLD"? (Shackleton, Scott and Amundsen) and his attempt to become the oldest Canadian to reach the South Pole. When I first sat down with Ian to hear his story I was instantly captivated. Here was a high school drop out who eventually became a Chartered Accountant, climbed five of the seven summits, cycled solo 5,000 km across Australia and almost died on his successful summiting of Mount Elbrus, Russia. It is safe to say that Ian is not satisfied with “the ordinary”. 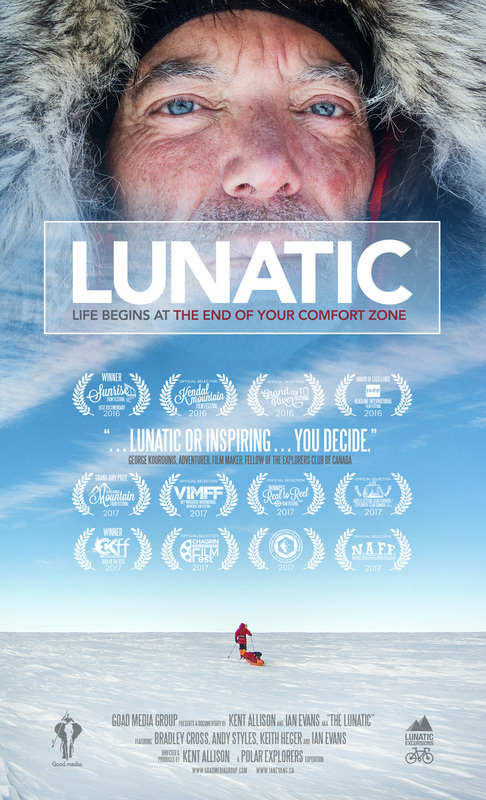 In the making of this documentary however, I started to wonder if he was really the “lunatic” that many had labeled him because after all, he’s lived a fuller life than many of us who are tethered to our computers trying to make a “living”. Maybe G.K. Chesterton was on to something when he said that it’s the lunatic who “lives in a small world, but thinks it is a large one”.